I first encountered the relatively new-to-the-market brand Echobox Audio when I visited the firm’s stand at the CanJam London 2015 event. What initially caught my eye was the distinctive Echobox Explorer streaming-enabled, audiophile-grade personal audio player, which is shaped much like the sort of hip flask one might use discreetly to keep a wee bit of fine whisky close at hand. 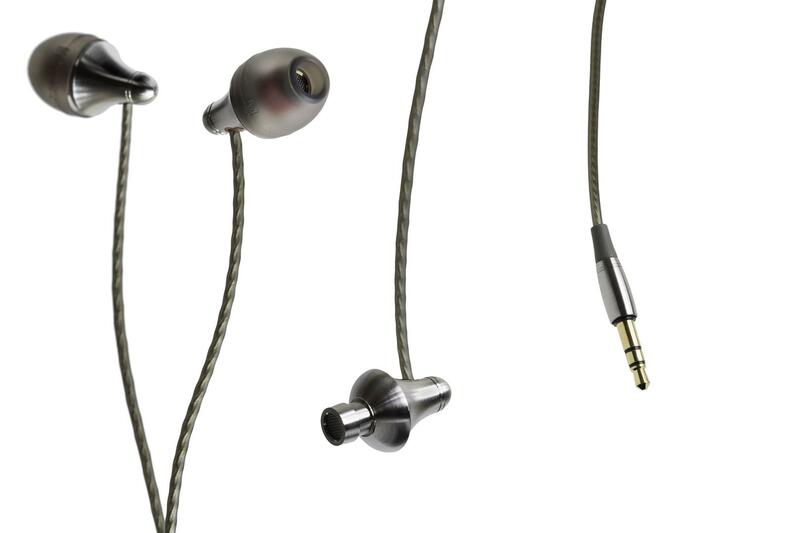 But attractive though the Explorer was and is, perhaps an even more significant Echobox product turned out to be the firm’s Finder X1 titanium earphones. I say this because the Finder X1 represents a serious attempt to offer a set of very high-quality and also seriously high-performance universal-fit earphones at a sensible, sub-£200 price. Let me begin by observing that Echobox appears to be doing a great many things right with the Finder X1 design. For starters, the X1’s elegant and extremely lightweight earpieces are beautifully made from machined titanium – a comparatively exotic metal not-commonly used in earphones at this price point. The earpieces, per se, are quite short and have a gently flared shape reminiscent of the curved form of a trumpet’s bell, only in miniature. Protruding from the ‘bells’ of the earpieces are short sound outlet tubes whose rims are threaded so as to provide attachment points for any of the three included sets of screw-on sound-tuning filters. As a welcome detail touch, the sides of the flared earpieces bear faintly visible etched ‘L’ and ‘R’ channel identification markers. Then, Echobox includes tiny recessed, side-facing, colour-coded (red for right, black for left) cable strain reliefs through which the X1’s signal cables protrude. Internally, the X1 earpieces are equipped with 9.2mm dynamic drivers fitted with PEEK (Polyether Ether Ketone) diaphragms. PEEK is a light, stiff, and durable thermoplastic polymer material that has seen use in aerospace, automotive, medical, and other applications. Echobox, though, says its PEEK drivers “utilize spread-spectrum technologies to achieve maximum transparency in midranges and high frequencies” – a claim largely borne out by our listening tests. The 1.2m-long signal cables used on the X1 are special, too, featuring silver-plated copper conductors sheathed in sturdy and tangle-free jackets. The cables terminate in a machined metal mini-jack plug and are not user replaceable, though at this price point one typically would not expect them to be. Our review samples came equipped with audio-only signal cables (that is, sans mic/remote controls), but Echobox also offers a $229 Finder X1i model whose cables include inline mic and remote controls for Apple iPhones.